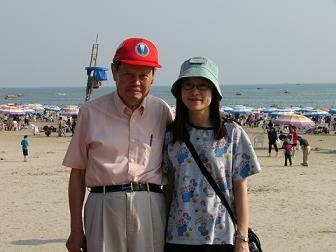 楊振寧 (Chen Ning Yang, Physics Nobel Prize winner), at age 82, engaged with a beautiful 28 years old wife in November 2004. Bill: I knew about this from a bay area TV show. The TV show is having people calling in to express their view about this. Several female callers seem to be upset. "This is nasty." "I can't believe he did this." -- those were things they said. I laughed about their comments. BEIJING - An 82-year-old Nobel Prize-winning physicist plans to marry a 28-year-old Chinese graduate student next month, a news report said Friday. Chinese-born Franklin Chen Ning Yang spent most of his career in the United States before returning to China last year following the death of his first wife. Chen plans to marry Weng Fan, a student of foreign trade at Guangdong University in southern China, the official Xinhua News Agency reported. It cited an unidentified official at Tsinghua University in Beijing, where Chen teaches. Yang announced his marriage plans in an e-mail to friends that included a poem he wrote in English about his fiancee, Taiwan's United Daily News reported. The poem read, in part: "Oh, sweet angel, truthfully you are/ God's benevolent last gift/ To give my old soul/ A joyous rejuvenating lift," the paper said. Yang shared the 1957 Nobel with colleague Lee Tsung-dao. He became a U.S. citizen in 1964 and held professorships at the Institute for Advanced Study in Princeton, New Jersey, and at the State University of New York at Stony Brook, according to Brittanica.com. A biography on the Nobel Prize Web site described Yang as "a quiet, modest, and affable physicist." Nobel Prize laureate Chen Ning Yang, 82, will marry a 28-year-old post-graduate from south China's Guangdong Province next month, an official with Beijing-based Tsinghua University announced. Friday, repots Xinhua. 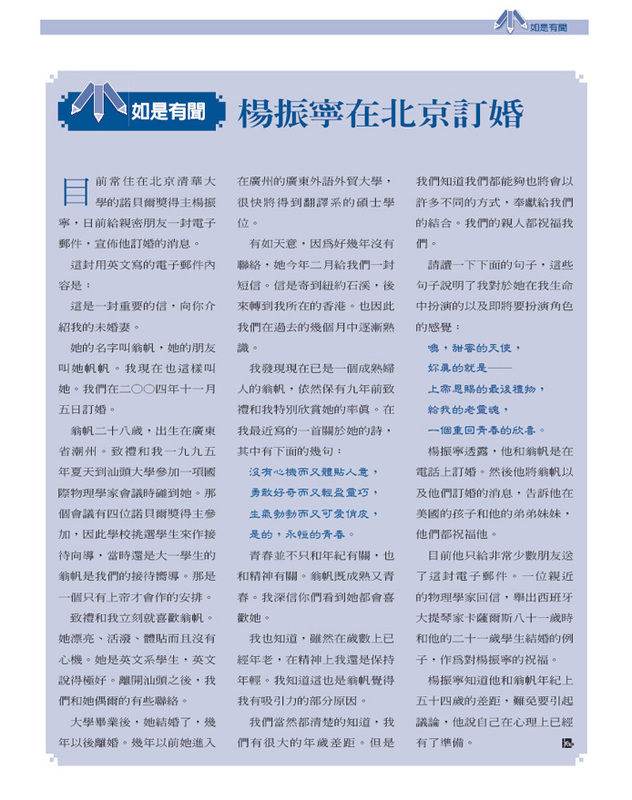 As marriage is a private matter, the official hopes people in all social sectors will respect Yang's choice, said Xinhua. Yang's fiancee, Weng Fan, is working for a master degree at Guangdong University of Foreign Studies and Foreign Trade. They are expected to get married in January at the end of Yang's current semester courses at Tsinghua University. Yang's former wife died of illness in October 2003. Two months later, Yang retired from his post in the US and settled down at Tsinghua University. Born in Hefei in east China's Anhui Province in1922, Chen Ning Yang was awarded a scholarship for study abroad after graduation from China. In 1945 he entered the University of Chicago, where hereceived his doctorate in physics in 1948. In 1957 Yang shared the Nobel Prize in Physics with his friend and colleague Tsung Dao Lee for their joint work in upsetting the principle of conservation of parity as a fundamental law of nuclear physics.